THE IRISH GOVERNMENT has donated the recently-decommissioned LÉ AOIFE to Malta to help the Mediterranean country deal with the ongoing refugee crisis in the region. 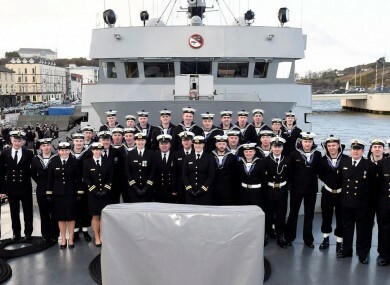 The Department of Defence had initially planned to sell the ship, as it did with the decommissioned LÉ Emer in 2013 (it reached €320,000 at an auction in Cork). However, Minister Simon Coveney confirmed earlier this week that another course of action was being considered, after an approach from Malta. “Following discussions with my Maltese counterpart, I understand that the Maltese authorities require this ship for their armed forces to patrol the Mediterranean Sea to endeavour to deal with the ongoing difficult refugee crisis in the region,” Coveney said. In a statement today, Coveney confirmed that the transfer of the ship had been formally agreed at a meeting of EU defence ministers in Latvia. “While the vessel is no longer viable for use in Irish waters it is ideally suited to address a pressing short-term shortfall in the naval capacity of Malta,” he said. Coveney said that the refugee crisis represented a significant challenge for the EU and that while Ireland wasn’t at the front line of the crisis, the country was pleased to be in a position to support the response. The two ministers, according to the statement “instructed their officials to deal with the formal modalities of the transfer of ownership of the ship at the earliest opportunity”. Email “We've just given Malta a naval ship, instead of selling it”. Feedback on “We've just given Malta a naval ship, instead of selling it”.